Swoboda’s is an amazing play, a combination of, luck, instinct and precision timing. But what fascinates me most is the sheer quickness at which the play unfolds. Brooks Robinson’s line drive off Tom Seaver is headed to the gap in right center field seemingly before Robinson has even left the batter’s box. There is no reaction time. Swoboda dives for the ball, his body stretched as if on a Medieval rack. He spears the ball in the webbing of his glove, rolls over and is up on his feet in one motion to make the throw into the infield. All this action happens in seconds. That there were 2 runners on in the ninth inning of a one run game, pivotal game 3 of the series, gives it even more meaning. Had Swoboda not made the catch the Mets very likely would have lost the game and the series to the heavily favored Orioles. 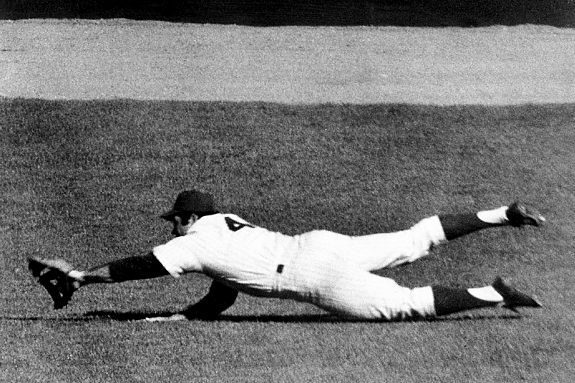 One of the enduring images of the 1960s, the Mets world series victory, would never have occurred. Watching the Rangers celebration following their victory against the Yankees the other day, I couldn’t help but think of Chris Chambliss’s game winning home run off Mark Littell in game 5 of the 1976 AL Championship series. Remember that scene of total pandemonium as fans spilled out of the stands and onto the field. Chambliss could not even finish rounding the bases but headed straight for the dugout after touching second base. In fact some of the baseball’s most memorable images are as much about the fans as they are about any player or great play. Another example is the timeless picture of Bill Mazeroski’s crossing the plate as he is mobbed by fans after his HR in game 7 of the 1960 World Series. Contrast these images to the highly choreographed celebrations that we see during the playoffs and World Series nowadays. The Rangers , for example, took a “victory lap” and then ascended a stage that had been erected out by second base where they accepted the AL Championship trophy and gave interviews on National TV while sipping Ginger Ale. The whole thing looked more like a political convention than a pennant celebration. Fans, of course, were not allowed onto the field. They never are any more. Alas. I have often wondered about this. 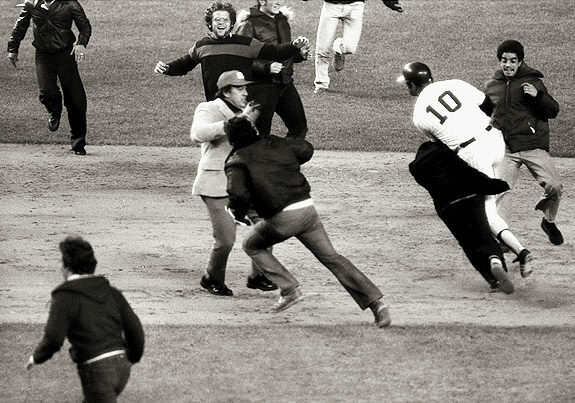 When I was a kid you always looked forward to that last out of the World Series when fans spilled out onto the field in unbridled joy and anarchy. In fact, they still allow this in college sports. Watch an NCAA football game and you will see fans routinely tear down goal posts after an upset. But MLB for some reason no longer allows fans on the field and teams, come playoff time, line the perimeter of the field with heavy security to prevent such behavior. The cynical side of me says that they do this not to protect fans, as teams are wont to say, but to protect the players and, more importantly, the millions and millions of dollars invested in them. Regardless, the result is that great moments do not become great images. Compare Chambliss’s HR to Aaron Boones HR in game 7 of the 2003 AL Championship series. Although both home runs sent the Yankees to the World Series, Boone’s home run, one could argue, was much more dramatic coming as it did in extra innings against the arch rival Red Sox. Yet that moment is not imprinted in our minds because there was no ensuing celebration like we saw with the Chamblis home run. Fans were kept off the field while Boone simply rounded the bases and went into the dugout. One of the great finishes in baseball history ended just like any other game.